This article is about the fox. For other uses, see Gray fox (disambiguation). The gray fox (Urocyon cinereoargenteus), or grey fox, is an omnivorous mammal of the family Canidae, widespread throughout North America and Central America. This species and its only congener, the diminutive Channel Island fox (Urocyon littoralis), are the only living members of the genus Urocyon, which is considered to be the most basal of the living canids. Though it was once the most common fox in the eastern United States, and still is found there, human advancement and deforestation allowed the red fox to become more dominant. The Pacific States still have the gray fox as a dominant. It is the only American canid that can climb trees. Its specific epithet cinereoargenteus means " ashen silver". Urocyon progressus, also known as the progressive gray fox. 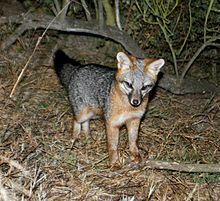 South American gray fox, also known as the gray zorro. ^ Cypher; et al. (2008). "Urocyon cinereoargenteus". IUCN Red List of Threatened Species. Version 2008. International Union for Conservation of Nature. Retrieved 6 May 2008. ^ a b "Urocyon cinereoargenteus". Animal Diversity Web. Retrieved 19 August 2007. ^ Common Gray Fox (Urocyon cinereoargenteus). Nsrl.ttu.edu. Retrieved on 2013-01-26. ^ a b c d e Fritzell, Haroldson, Erik, Kurt (November 1982). "Urocyon cinereoargenteus". Mammalian Species: 1–8. ^ a b Alderton, p. 122. ^ Paleobiology database, Collection 19656, Graham County, Arizona. Authority by the Dr. John Alroy, 18 February 1993. ^ Geffen, E.; Mercure, A.; Girman, D. J.; MacDonald, D. W.; Wayne, R. K. (September 1992). "Phylogenetic relationships of the fox-like canids: mitochondrial DNA restriction fragment, site and cytochrome b sequence analyses". Journal of Zoology, London. 228: 27–39. doi: 10.1111/j.1469-7998.1992.tb04430.x. ^ a b c d Fritzell, Erik K.; Haroldson, Kurt J. (1982). "Urocyon cinereoargenteus" (PDF). Mammalian Species. 189 (189): 1–8. doi: 10.2307/3503957. JSTOR 3503957. Archived from the original (PDF) on 22 January 2012. Retrieved 27 November 2011. ^ Graham RW; Lundelius Jr. EL. FAUNMAP II: New data for North America with a temporal extension for the Blancan, Irvingtonian and early Rancholabrean (Report). FAUNMAP II Database, version 1.0; 2010. Retrieved 13 December 2015. ^ Bozarth, Christine A.; Lance, Stacey L.; Civitello, David J.; Glenn, Julie L.; Maldonado, Jesus E. (2011). "Phylogeography of the gray fox (Urocyon cinereoargenteus) in the eastern United States" (PDF). Journal of Mammalogy. 92 (2): 283–294. doi: 10.1644/10-MAMM-A-141.1. Retrieved 27 November 2011. ^ a b Natalie S. Goddard; Mark J. Statham; Benjamin N. Sacks (19 August 2015). "Mitochondrial Analysis of the Most Basal Canid Reveals Deep Divergence between Eastern and Western North American Gray Foxes (Urocyon spp.) and Ancient Roots in Pleistocene California". PLOS ONE. 10 (8): e0136329. doi: 10.1371/journal.pone.0136329. PMC 4546004. PMID 26288066. ^ Fuller, T.K. ; Cypher, B. L. (2004). C. Sillero-Zubiri; M. Hoffman; D. W. Macdonald (eds.). Gray fox Urocyon cinereoargenteus. pp. 92–97 in Canids: foxes, wolves, jackals, and dogs. Status survey and conservation action plan (PDF). Cambridge, United Kingdom: IUCN Publications. Retrieved 27 November 2011. ^ Wayne, R. K.; Geffen, E; Girman, D. J.; Koepfli, K. P.; Lau, L. M.; Marshall, C. R. (1997). "Molecular Systematics of the Canidae". Systematic Biology. 46 (4): 622–653. doi: 10.1093/sysbio/46.4.622. PMID 11975336. ^ "Nature Canada". Naturecanada.ca. Retrieved 29 January 2019. ^ Wozencraft, W.C. (2005). "Order Carnivora". In Wilson, D.E. ; Reeder, D.M (eds.). Mammal Species of the World: A Taxonomic and Geographic Reference (3rd ed.). Johns Hopkins University Press. p. 582. ISBN 978-0-8018-8221-0. OCLC 62265494. ^ Kurten B, Anderson E (1980). Pleistocene mammals of North America. New York: Columbia University. ISBN 978-0231037334. ^ a b Fedriani, J. M.; Fuller, T. K.; Sauvajot, R. M.; York, E. C. (2000). "Competition and intraguild predation among three sympatric carnivores". Oecologia. 125 (2): 258–270. doi: 10.1007/s004420000448. hdl: 10261/54628. PMID 24595837. ^ Goddard-Taylor, Gayle (Winter 2005–2006). "The Silver Ghost: The life and times of the gray fox". Sanctuary: The Journal of the Massachusetts Audubon Society. 45 (2): 13–15. ^ a b Alderton, p. 124. ^ Mills J. H., Hirth R. S. (1968). "Lesions Caused by the Hepatic Trematode, Metorchis conjunctus, Cobbold, 1860: A Comparative Study in Carnivora". Journal of Small Animal Practice. 9 (1): 1–6. doi: 10.1111/j.1748-5827.1968.tb04678.x. Wikimedia Commons has media related to Urocyon cinereoargenteus.